Clear dish washing detergent- mix 1/4 teaspoon of detergent with 1 cup warm water. Hydrogen Peroxide/Ammonia solution- mix 1/2 cup hydrogen peroxide (3% solution available in drug stores) with one teaspoon undiluted, unscented clear, non sudsy, household ammonia. Mixture must be used within two hours of mixing. White vinegar Clean dry cloths Paper towels Plastic Wrap Scrape or blot up excess spill. Apply detergent solution to carpet using a damp cloth. Blot- do not rub or scrub If stain is removed, follow with step 5 and stop. If spot is not removed, continue with step 6. Using a fresh cloth, apply clean water to rinse, insuring that you remove all detergent residue. If spot remains, apply ammonia using a damp cloth. Blot, do not rub or scrub. Apply hydrogen peroxide/ammonia solution, let stand for 2-3 hours under a weighted sheet of plastic wrap. (for weight use a water bottle or glass baking dish) Repeat application of hydrogen peroxide/ammonia solution and allow to dry until removal is complete. Apply undiluted white vinegar using a clean dry cloth only after stain is removed. Apply water with a damp towel to rinse. Blot. Apply a thick stack of paper towels to the area and weight them with a heavy object such as a jug of water or glass baking dish and leave for several hours. Solvent- Liquid, non oily, non caustic type sold for spot removal from garments. Use products for grease, oil and tar removal such as Carbona and Afta. Do not apply directly to the carpet to prevent damage. Clear dish washing detergent- mix 1/4 teaspoon of detergent with 1 cup warm water. Clean dry cloths Paper towels Apply solvent to dry towel/cloth. Blot- don’t rub or scrub. Repeat steps 1 & 2 until there is no longer transfer Apply detergent solution to carpet using a damp cloth. Blot- do not rub or scrub Using a fresh cloth, apply clean water to rinse, insuring that you remove all detergent residue. Apply a thick stack of paper towels to the area and weight them with a heavy object such as a jug of water or glass baking dish and leave for several hours. If any stain remains after the wicking process, repeat steps 4-8. Solvent- Liquid, non oily, non caustic type sold for spot removal from garments. Use products for grease, oil and tar removal such as Carbona and Afta. Do not apply directly to the carpet to prevent damage. Clear dish washing detergent- mix 1/4 teaspoon of detergent with 1 cup warm water. Clean dry cloths Paper towels Apply solvent to dry towel/cloth. Blot- don’t rub or scrub. 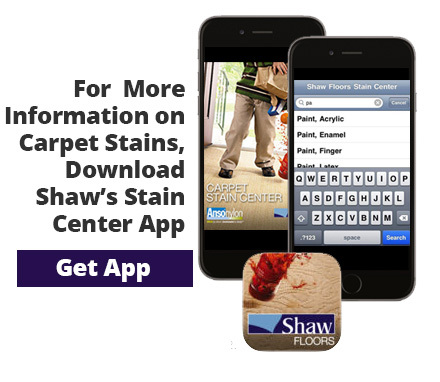 Repeat steps 1 & 2 until there is no longer transfer Apply detergent solution to carpet using a damp cloth. Blot- do not rub or scrub Using a fresh cloth, apply clean water to rinse, insuring that you remove all detergent residue. Apply a thick stack of paper towels to the area and weight them with a heavy object such as a jug of water or glass baking dish and leave for several hours. If any stain remains after the wicking process, repeat steps 4-8. . Or try a professional cleaner. Clear dish washing detergent- mix 1/4 teaspoon of detergent with 1 cup warm water. Clean dry cloths Paper towels Scrape or blot up excess spill. Apply detergent solution to carpet using a damp cloth. Blot- do not rub or scrub Using a fresh cloth, apply clean water to rinse, insuring that you remove all detergent residue. Apply a thick stack of paper towels to the area and weight them with a heavy object such as a jug of water or glass baking dish and leave for several hours. If any stain remains after the wicking process, repeat. Solvent- Liquid, non oily, non caustic type sold for spot removal from garments. Use products for grease, oil and tar removal such as Carbona and Afta. Do not apply directly to the carpet to prevent damage. Clear dish washing detergent- mix 1/4 teaspoon of detergent with 1 cup warm water. Clean dry cloths Paper towels Apply solvent to dry towel/cloth. Blot- don’t rub or scrub. Repeat steps 1 & 2 until there is no longer transfer Apply detergent solution to carpet using a damp cloth. Blot- do not rub or scrub Using a fresh cloth, apply clean water to rinse, insuring that you remove all detergent residue. Apply a thick stack of paper towels to the area and weight them with a heavy object such as a jug of water or glass baking dish and leave for several hours. If any stain remains after the wicking process, repeat steps 4-8. Or try a professional cleaner. Vacuum cleaner Scrub brush or toothbrush Clear dish washing detergent- mix 1/4 teaspoon of detergent with 1 cup warm water. Paper towels Vacuum as much as possible. Loosen remaining material by tapping with a scrub brush or toothbrush. Tap with brush, do not rub or scrub. Vacuum again. If a stain remains, follow with detergent solution. Apply detergent solution to carpet using a damp cloth. Blot- do not rub or scrub Using a fresh cloth, apply clean water to rinse, insuring that you remove all detergent residue. Apply a thick stack of paper towels to the area and weight them with a heavy object such as a jug of water or glass baking dish and leave for several hours. If any stain remains after the wicking process, proceed to the next procedure, What you will need: Clear dish washing detergent- mix 1/4 teaspoon of detergent with 1 cup warm water. Clean dry cloths Paper towels Scrape or blot up excess spill. Apply detergent solution to carpet using a damp cloth. Blot- do not rub or scrub Using a fresh cloth, apply clean water to rinse, insuring that you remove all detergent residue. Apply a thick stack of paper towels to the area and weight them with a heavy object such as a jug of water or glass baking dish and leave for several hours. If any stain remains after the wicking process, repeat. These stains should be removed only by a professional cleaner.